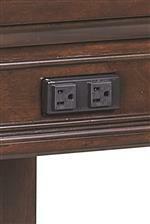 This media chest features an attached electrical outlet for convenient and easy device set up. The outlet acts as a power bar, so you can stop snaking extension cords and extra wiring across your bedroom floor, and instead safely connect your media consoles or laptop directly to the chest. Hide wires, organize your devices, and never worry about tripping over cords on the floor again with the included electrical outlet. 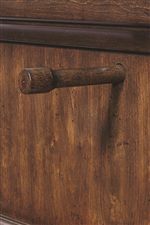 This chest’s included drop front drawer encourages you to make the most of a small space with its convenient and versatile function. The drawer front opens downwards and a tray slides out, allowing you to keep a DVD player or cable box discreetly tucked away, while providing remote access to your device with the flip of a drawer. With the drawer slid open, the chest can be converted into a desk, offering a simple workspace and storage perfect for a laptop. Included AC outlets ensure easy hookup for your computer or media devices, helping you keep your bedroom organized and your floor free of wires. 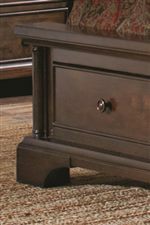 The rich mocha brown knotty alder finish of this chest makes it a beautiful and refined place to store and use your media. Two top drawers flip down to turn the piece into a desk or to give you easy access to media players, and the second drawer has HDMI/RCA/AC outlets to charge your devices. A cedar-lined bottom drawer keeps your belongings fresh and pest free. 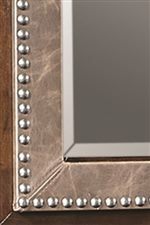 Supported by elegant bracket feet and decorated with oil bronzed hardware, this piece will be a stately addition to your bedroom. The Bancroft 4 Drawer Liv360 Entertainment Chest by Aspenhome at Walker's Furniture in the Spokane, Kennewick, Tri-Cities, Wenatchee, Coeur D’Alene, Yakima, Walla Walla, Umatilla, Moses Lake area. Product availability may vary. Contact us for the most current availability on this product.